Thanks for sharing. Love reading your blog. About eight months ago, I was diagnosed with Parkinson’s at my pre-op for my lumpectomy. I struggled through the Spring with treatments and acceptance of both diagnoses. I so enjoy your narratives and the knowledge that after 8 years – your world continues and your friendships grow. Thank you. I am so sorry you are going through the same thing. I encourage you to meet some other women with Parkinson’s when you are feeling up to it. It really makes a big difference in how you view the world through PD glasses. Hi! I really enjoy your blog and your attitude and for baring your soul. The fact that you were diagnosed with breast cancer and Parkinson’s at the time is almost too much to take.. I was diagnosed last year at 55 but I was exhibiting signs at 52. I wished I had met you this year at the World Congress in Portland, OR. Thank you for you kind words. 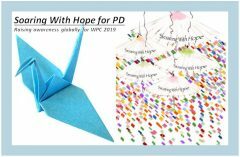 Hopefully there will be other opportunities to meet before the next WPC. “Twitchy Woman” is such a great name for your blog! Thank you for the well-written blog. I was recently diagnosed at age 57 as well. I would be very interested in knowing what your stage of progression is now, for obvious reasons. I find it helpful to read what you have written. In answer to your question, my progression has been very slow. I did not start taking Sinemet until February, 2014, 5 years after my diagnoses. I have tremor predominant PD, which typically progresses slowly. PD is considered a designer disease since no one size fits all. Since each person has a totally different path with PD, you cannot assume that you will ave the same progression as I did. I am glad you are enjoying my blog and are finding it helpful. Please feel free to get in touch with me if you have any other questions. I have had Parkinson’s for six years and was recently diagnosed with breast cancer . I can’t find much info on this topic and I am scheduled for chemo at the end if this month . My Parkinson’s cause alit if stiffness and pain and I worry that the chemo amplify it . Did you have chemo? How did you do with it? Fortunately for me I did not have chemo. I had a lumpectomy and radiation. I slept for about 6 months! Good luck with your treatment. Diagnosed finally as PD, age 63, about five years later I had the option of having an endoscope examination of my large intestine again (to check for possible blockage or cancer), since my abdomen sticks out much more than before and the constipation was severe. Discussing thoroughly with my doctors (neurologist for PD, also a psychiatrist, as well as an internal medicine MD), I chose not to take the exam again. I had had it done about 5 years or so before and the results were negative regarding cancer (viz.,: no cancer). The internal medicine MD said an “ENSHO” (Japanese for [probably] “inflammation”) had been removed by the wire inside the endoscope, causing some bleeding but curing the constipation for a while. Yet, this second time, I realized that the constipation might be due either to PD itself or to the aging of the intestine, which had suffered an unusual appendectomy at age 22. The (then) usual small slit on the right of the abdomen failed to show the appendix, so the surgeon made a vertical slit about three times longer in the abdomen, found the intestine twisted (he reported later to me), and (after removing the indeed infected appendix) “returned everything exactly like it was in the textbook.” I have since learned that many normal people have twisted intestines. Anyway, I figure that this oddity and the surgery may well contribute to rapid aging of the organ. I was very happy to learn from the doctor in Digestive Organ Surgery (whom I had at first asked about another colonoscopy) the possibility of taking the same laxative every night regularly whether constipated or not. This actually solved the discomfort of impaction (albeit that the protruding tummy still looks odd–that is gradually to yield to exercise to rebuild the cut muscles, never rehabilitated at the previous US countryside hospital.). General health insurance (the homeless only, perhaps, not yet included?) means very good care over here!